The Finally Light Bulb Company has created Acandescence™, an innovative lighting technology for everyday home use, which reliably recreates the same light as an incandescent without the energy waste or excessive cost. The light it produces is both eco and consumer-friendly, easy on the wallet and comfortable on the eyes. With roots in induction technology, Acandescence™ uses a copper coil – not a tungsten filament or an electrode – to generate light. Finally Light Bulbs are the first energy saving light bulb that truly replicates the warm and inviting light, no more harsh bright lights! They also are the classic light bulb shape, not an awkward spiral shape that does not look right in most lamps and lights. The warm light, the gentle shape of the light bulb brings you back to earlier times. The warm glow just makes everything so much softer and warmer feeling, more homey! 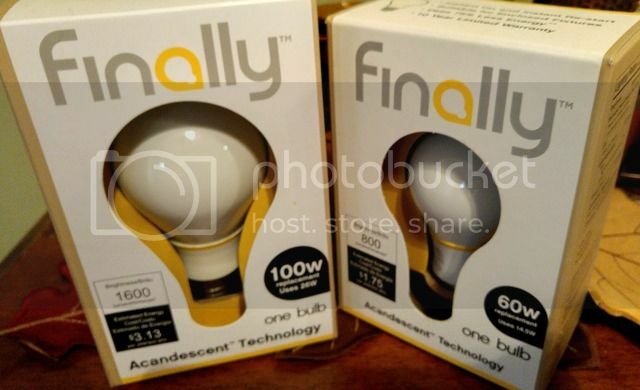 Finally Light Bulbs are available for purchase on their site as well as sites like Quidsi.com, Soap.com, Diapers.com and Casa.com. The 60 Watt replacement retails for $9.99. The 100 Watt is available for pre-order at $14.99 (reduced from $17.99 as listed in the spec sheet). Finally will also be offering a 75 Watt Replacement bulb.